If you love the taste of a warm fresh tomato or a crisp leafy green, stop by, borrow some seed and grow your own. What’s a Seed Savers Library? Our Seed Savers Library promotes growing food from organic, heirloom seed. We have more than 100 varieties of seed. Some are native varieties. Many have been collected from local gardeners who have been saving seeds for generations. Read more about our mission. Once you become a registered seed saver, you can borrow seeds free of charge. We ask only that you save seeds from your harvest and return them to share with other gardeners in our community. The Seed Savers Library is coordinated by Randy Smith. If you have questions, send him an email. Anyone is eligible to sign up. You can also visit the Virginia Room at Main Library. Registration and checkout cards are available on top of the seed card catalog. 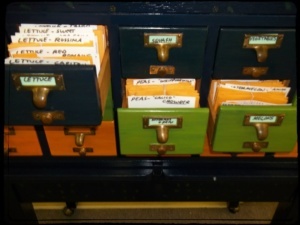 The Seed Savers Library catalog is self-serve. After you fill out a card (or just record your name, if you’ve already registered online), pick out the seeds you want to take home. On the back of your card, please write down what seeds you are taking to help us keep track of our inventory. Instructions on saving seeds are provided in growing guides. We want to keep these seed varieties as a renewable resource for many years, so we ask that you save seeds from your mature plants and return them to the library. We’ll take care of the storage. We also hold classes to help you grow your plants, preserve your harvest and save the seeds. Check our library calendar for upcoming events. The Seed Savers Library is supported by a grant from the Raymon Grace Foundation.